A SpaceX Falcon 9 rocket launches the U.S. Air Force's robotic X-37B space plane on Sept. 7, 2017. The first stage of this same rocket is scheduled to help loft the SES-12 communications satellite on June 1, 2018. SpaceX will launch a communications satellite early Monday morning (June 4), and you can watch the liftoff live. A SpaceX Falcon 9 rocket with a used first stage is scheduled to lift off from Florida's Cape Canaveral Air Force Station at 12:29 a.m. EDT (0429 GMT) Monday and carry the SES-12 satellite to orbit for the Luxembourg-based telecom company SES. You can watch the launch live here at Space.com, courtesy of SpaceX, or directly via SpaceX's website. 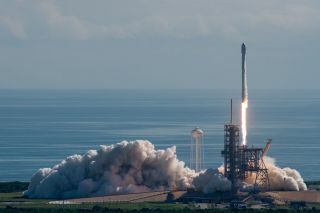 The launch was originally scheduled for May 31, with SpaceX delaying it first to June 1 and then June 4 to perform extra rocket boooster checks. The first stage has flown once before, in September 2017, when it helped launch the robotic X-37B space plane for the U.S. government. The booster came back to Earth for a pinpoint landing shortly after that liftoff, but there will be no such downward action during the SES-12 mission: The first stage is part of the Falcon 9 "Block 4" build, an older variant that SpaceX is phasing out. The company recently debuted the new "Block 5" Falcon 9, whose first stages are designed to fly 10 times with just inspections between landing and launch, and 100 times or more with some refurbishment involved, SpaceX founder and CEO Elon Musk has said. Achieving such heavy reuse is the key breakthrough that will slash the cost of spaceflight and make ambitious exploration endeavors, such as the colonization of Mars, economically feasible, according to Musk. Musk has also expressed a desire to reuse the two-stage Falcon 9's upper stage and its payload fairing, the nose cone that protects satellites during launch. But so far, it's just the first stages that have been landed and launched again. To date, SpaceX has landed such boosters 25 times and reflown them on a dozen occasions. SES-12 is headed for geostationary orbit, about 22,300 miles (35,900 kilometers) above Earth's surface. It will provide video and data services to customers across the Asia-Pacific region, SES representatives said. Editor's note: This story, posted May 31 in advance of the SpaceX's targeted June 1 launch, has been updated to include the launch delay to June 4 for SpaceX's Falcon 9 rocket and SES-12.